"Don't let the cameras throw you." If Elvis Presley's career had a tipping point, it's right here in this documentary�it's a carefully controlled behind-the-scenes concert film made in 1970, and with the benefit of hindsight, we can see the King making the turn. Well back in the rear view mirror is the young and hungry Elvis who brought an African American sensibility to popular music and made it palatable for white audiences, breaking taboos along the way, even if Ed Sullivan would only shoot him from the waist up; and you can see the seeds being sown for the later, fatter Elvis, the one that was drug addled and porcine from fistfuls of pills and plates of fried banana sandwiches. He's still got some pipes, though, that's for sure, and for the first time in a while at this point in his professional life, Elvis actually looks like he's having a bit of fun. Presley's public persona was always tightly controlled, and any thought that we'd be getting an unvarnished, Maysles-like portrait of Elvis is quickly disabused by the opening credits, in which we read the Col. Tom Parker, Elvis's manager, was the film's technical advisor. We also see a lot of the usual suspects of the Memphis mafia, the corps of yes men and enablers who laughed too loudly at Presley's jokes, catered to his every whim, and did their best to keep him fat and happy. (Yes on the first, no on the second, it seems.) But the Presley posse aside, Elvis is actually humanized here�cutting up with his musicians, wincing when he hits a wrong note in rehearsal, wanting to do right by his rabid fan base, because it's clear that he's hungry for their love. The film commemorates Elvis's return to the concert stage after years of appearing only in bad movies and issuing many recordings�you can see that the Colonel was looking to milk the cash cow, and so much of the Elvis catalog is about quantity and not quality. You also see here the beginnings of what became almost the self-parodying Elvis in his final years, whipping towels to shrieking middle-aged women, with both the performer and his audience hoping to revisit the glories of their youth. Anyway, the making-of stuff is less interesting than the concert footage, and Presley is generally in very good voice�he delivers the requisite greatest hits (Heartbreak Hotel, That's All Right, Mama, Love Me Tender and so on), but actually seems to be having a better time covering other people's songs, if for novelty's sake, if nothing else. So the unexpected highlights here include his versions of You've Lost That Lovin' Feelin', the overplayed and over-emotive Bridge Over Troubled Water and (my favorite of the set) a spirited rendition of Sweet Caroline. You can see just how Vegas he's gone in the closing credits, which roll over footage from an opening night reception, at which Elvis is congratulated by, among others, Mr. Sammy Davis Jr. What's especially nice about this two-disc set is that it includes both a recut 2001 version, emphasizing Presley's performance, and the original 1970 theatrical release (01h:49m:19s) on the second disc, which runs longer because of the extra time we get to spend behind the scenes, though you'll get a little antsy for Elvis to get onstage. Image Transfer Review: The 2001 cut looks a bit sharper; the colors in the original version have bled some, and tend to look a bit muddy. Audio Transfer Review: The music is the reason to check out this set, and it sounds all right if a bit overmixed on the 5.1 track�it sounds as if atmospherics were emphasized a bit too much, so you get a sense of the event at the price of some clarity. 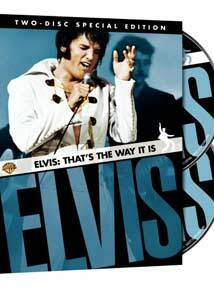 Extras Review: Disc One includes brief bios on Presley, director Denis Sanders, and film restorer Rick Schmidlin, along with a Presley filmography and a few panels of text on where the documentary fits in Elvis's career; there's also a restoration featurette (9m:12s) in which Schmidlin figures prominently, as do Presley's backup musicians. The second disc sports a package (37m:11s) of 12 deleted scenes, including backstage footage, alternate versions of songs performed in the final cut, and a reminder of the weight gain to come with extended shots of Elvis eating. Also, a sticker on the front of the slipcase promises a 24-page photobook, but none came with the set sent along for review. The backstage stuff is for Presley diehards exclusively, but the King is in full command in the ample concert footage.